RBTH presents a selection of views from leading Russian media on international events, featuring reports and analysis focused on Russian President Vladimir Putin's meeting with his French counterpart Francois Hollande in Moscow on Dec. 6 and the potential implications of the talks for the de-escalation of the confrontation over Ukraine. The Kommersant daily gives an account of Russian President Vladimir Putin's meeting with his French counterpart Francois Hollande, which took place at Moscow's Vnukovo airport on Dec. 6. The French president's visit has become the first visit by a Western leader to Russia since the start of the Ukrainian crisis, the paper points out. After German Chancellor Angela Merkel toughened her position on Russia, France in effect remains the only "European heavyweight" capable of establishing a dialogue with Moscow, Kommersant says. 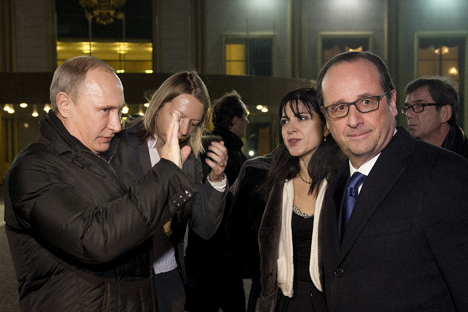 After his talks with Putin, Hollande had a telephone conversation with Merkel. Experts polled by Kommersant say that this suggests that at some point Berlin may join in the mediation efforts being undertaken by Paris. In addition, Kommersant says citing French media, in the near future Russia and the European mediators may agree on a division of labor of sorts in resolving the Ukrainian crisis: Moscow will start putting pressure on the militias in the breakaway ‘republics’ of Donetsk and Lugansk in the Donbass region of eastern Ukraine, while Paris and Berlin will try to influence Kiev. This may happen in the very near future: The next meeting of the contact group on Ukraine is due to be held in Minsk on Tuesday to discuss the cessation of hostilities in the Donbass. It is not expected that any new agreements will be drawn up; rather mechanisms for implementing the already signed agreements are necessary. "The attempt to agree on a ceasefire is just a confirmation of the fact that the sides need a respite to resolve their internal problems," head of the Center for Political Research Foundation in Moscow Andrei Fyodorov told Kommersant, adding that Ukrainian President Petro Poroshenko first needs to complete the formation of his new parliament, the Verkhovna Rada. "Given that an impeachment bill has already been submitted to the Rada, Poroshenko does not want to take any risks. A military defeat would have fatal consequences for him," Fyodorov said. The Nezavisimaya Gazeta newspaper also covers Hollande's visit to Moscow. One of the most important signals that Paris has sent to Moscow, the newspaper points out, is that for the first time it has clearly formulated an assurance that France will not support Ukraine's accession to NATO. Experts express the opinion that France is trying to occupy the niche of the main Western negotiator with Russia and play a key role in overcoming the confrontation. Arnaud Dubien, head of the French-Russian think tank Observo (which operates under the aegis of the French-Russian Chamber of Commerce and Industry), told the newspaper that at the G20 summit in Brisbane in November, Francois Hollande "did not attack Putin.” He continued: "Unlike many other countries, France does not feel comfortable in the context of a growing confrontation with Russia. Furthermore, Paris is absolutely not happy with this situation." Dubien went on to say that Russia had for a long time relied on Germany, however Merkel had taken a very tough position in relation to Moscow. "I think this is Putin's main strategic mistake. Apart from France, there are no other countries remaining that could have claims to the role of a mediator," he told Nezavisimaya Gazeta. The Moskovsky Komsomolets daily offers a compilation of comments from Russian experts on the meeting between the Russian and the French presidents. "Europe was shocked by the news that Russia is shutting down the South Stream gas pipeline project," head of the Political Training and Consulting Center Oleg Kudinov told Moskovsky Komsomolets. "They pulled the strings for a long time, trying to get Russia to build everything but to make sure that the pipes belonged to them. And now, there will be no pipeline. Hence the need to secure supplies via Ukraine. But first the war there needs to end," he said. According to Kudinov, sanctions against Russia may soon start to be gradually lifted. "Russia is suspected of inciting the war in Ukraine. But it is also suspected of being able to stop it. The war in Ukraine is a war in Europe and everybody is worried by that. I expect a statement from Europe that it is softening its position on Russia if we assist in preventing a humanitarian catastrophe. Putin's statement on Ukraine's territorial integrity fits into this scheme," he said. For his part, head of the International Institute of Political Expertise Yevgeny Minchenko told Moskovsky Komsomolets that not much hope should be held out for an improvement in relations with Europe in the near future: "For the next three to four years, whatever Russia does, the attitude to us will only get worse. A very negative momentum has been built and it will be impossible to change it quickly," he said.